When it comes to anticipating the future of the workplace, it is often the word ‘automation’ which rings out amongst experts. Factories, restaurants, and shops, we are told, will be populated by robots and machines which will take care of tasks that historically required human input. Carrying out the labor that was once the preserve of a skilled workforce, these robots will ultimately free employees from their drudgery to enjoy lives filled with leisure and entertainment. Rather than clocking-in and putting in a shift each day, they will be able to pursue their hobbies and interests when they aren’t getting about in their driverless cars. Whilst this utopia may eventually come to pass, it would seem that the office is likely to remain a fixture in the working world for a little while yet. Indeed, with artificial intelligence and deep learning still emerging as dependable technologies, we can expect offices to be run by humans for at least the next twenty years or so. The question for the immediate future, then, is what will these offices look like and how people will carry out work in them. It would be fair to say that office culture has slowly been stripped of the formality it possessed in the 20th century. Indeed, instead of stuffy cubicle farms that inspire a universal dread, many modern workplaces have become buildings that employees actively enjoy spending time in. Whether it’s the allure of barista style coffee machines or state of the art games rooms, there’s no denying that many modern offices have become comfortable environments that feel anything but corporate. Some experts have predicted that this trend will continue, with the workplace becoming even more like a residential space that allows employees to carry out their work in a far more relaxed way. Other experts suggest that the office will no longer serve as the central hub of a business and employees will all work remotely from their own homes. This is certainly an interesting school of thought and many corporations are currently trialing technology which will allow their workforce to work remotely whilst staying in touch with their colleagues over a variety of devices. Interestingly, one study has estimated that half of the UK workforce will be working remotely by 2020. An interesting projection for employers who prefer to keep their team in one place when it comes to completing projects. A room of own’s own? 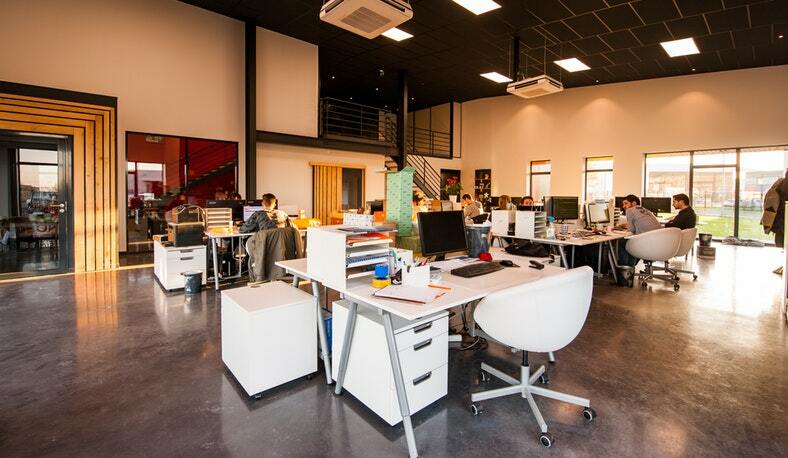 Thanks to a growing body of research into the psychology of employees and the optimum workplace, many offices now divide space in ways that have been shown to increase productivity. In practical terms, this has meant combining open-plan collaborative areas with closed-off workstations which allow employees to get their head down without suffering from any distractions. One of the most common ways of achieving this divide is through modular furnishings which can be constructed and reconfigured to create self-contained areas inside of open-plan layouts. Suppliers like Office Furniture Scene have already helped offices to adopt more flexible spaces with their selection of cove screens and acoustic pods. Allowing employers to install break out areas and meeting rooms without needing to build additional walls, these products are certainly indispensable when it comes to creating a modern office. Whilst it may appear that more and more employees are preferring to work from the comfort of their own home, it seems unlikely that the office as we know it will be made obsolete anytime soon. What seems more probable is the rise of comfortable working environments that combine various spaces for work and relaxation. Keeping fully connected with colleagues through a growing body of technology, it’s also quite likely that we’ll become more closely bound to our jobs before we give them up to the robots.